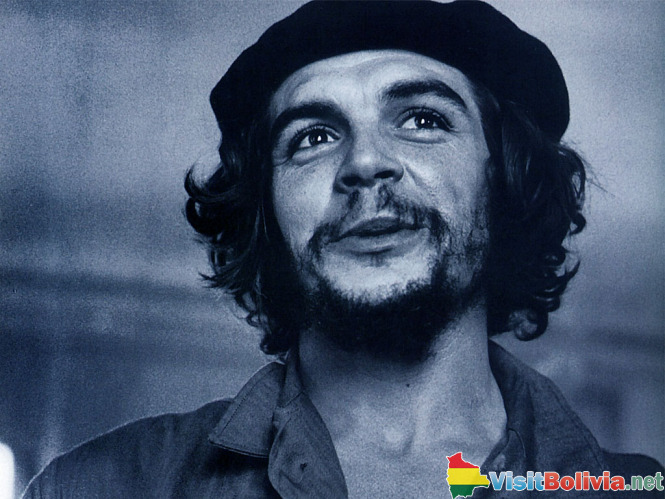 Most people are aware of Ernesto Che Guevara, the Argentine revolutionary who was such a major figure during the Cuban Revolution, but did you know that 'Che', as he was commonly known, also spent time in Bolivia, seeking to start a brand new revolution? In fact it's where Che's life came to an end when he was captured and executed by the Bolivian Army. Born on June 14th, 1928 Che's desire to change, what he believed was, the capitalist exploitation of South America by the USA came about as he travelled through the area during his years as a medical student, witnessing harrowing scenes of poverty, hunger and disease which were later documented in the famous 'Motorcycle Diaries'. To cut a long story short, by 1956 Che was involved in the Cuban Revolution and despite being wounded by the Cuban Army, he managed to survive and escape to continue his mission. He carried on participating in attacks and executions and proving his worth as a competent soldier and fearless leader until his guerrilla group, under the leadership of Fidel Castro, finally gained control of Cuba. But in April, 1965, Che left behind his life in Cuba, leaving not only the positions he had been given in the government, but also his wife and family. The revolutionary was hungry for a new revolution. After a failed attempt in theCongo in November 1966 he ended up in Bolivia. His arrival in Bolivia was inconspicuous to say the least. He'd changed his appearance and his name; he was now Adolfo Mena Gonzalez from Uruguay. Gone were his trademark black beret, long hair and beard and in their place was a balding, clean shaven, middle aged businessman. However once he'd made his entrance, he discarded his disguise and got on with the serious business of organising a revolution. His first mission was to find some supporters for his cause as quickly as possible. His supporters during the Cuban Revolution had been mainly Peruvian and Cuban and now he needed the Bolivians to add their support. However, this proved to be an almost impossible task. After approaching the Bolivian Communists they wouldn't get involved as Guevara point blank refused to allow the leader of the Communist Party to have overall control. Undeterred, Guevara turned his attention to the peasants of Bolivia, but this support also failed to materialise once the Bolivian government caught wind of what was happening. By initiating a propaganda campaign blaming Guevara and his rebels for attempting to bring Castro-led Communism into Bolivia, the government was able to bring the peasants' loyalty and patriotism to the fore making them totally unwilling to give any kind of help to Che and his guerrillas. After this, everything seemed to go downhill for Guevara. Before he'd had time to establish himself in Bolivia and build up his revolutionary force, the Bolivian government had not only discovered that he was in their country but they even knew his location. Less than six months after his arrival, Guevara was being pursued by the Bolivian Army, tracking him and his rebels so that they were constantly on the run and never able to set up a permanent base. During this time Guevara's health suffered as he often succumbed to asthma attacks; it left him powerless to lead an attack against the army and many of his men were captured or killed as the group was gradually broken up and worn down. By October, 1967 it was obvious that the end was in sight. The morning of 8th October saw Guevara and his sixteen remaining men, surrounded by the Bolivian Army Rangers. Caught up in a gully known as Quebrada del Churo, a gun battle ensued and many of the rebels were killed or captured. Guevara himself was wounded as a bullet caught his left leg and he was captured as he tried to escape. The Army took him to the nearby town of La Higuera where he was incarcerated in the school house and interrogated. The following day, the President of Bolivia gave the order for the execution of the revolutionary Che Guevara and so at ten minutes past one on the afternoon of 9th October, Guevara breathed his last as he was executed by Mario Teran, a Bolivian Army sergeant. After the execution Guevara's body was put on display so that soldiers and locals could see the remains of the guerrilla and take photos of him, some even going as far as to cut locks of his hair as 'good luck' symbols. Before burial in a secret grave on 11th October, his hands were removed and preserved in formaldehyde as proof that it was Guevara that they had killed. For the next thirty years, the location of his grave was kept secret, but in July of 1997, his skeleton, together with those of six of his revolutionaries were returned to Cuba, where they were reburied in Santa Clara.